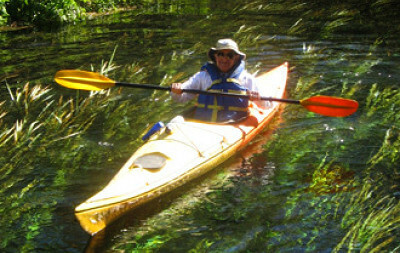 Intermediate — involves paddling 15 miles or more per day. 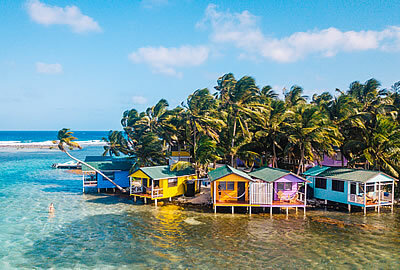 Most meals, lodging, kayaks, kayaking gear, guides, permits, ground transportation, and most everything else to make your vacation more enjoyable. Well known for its year round manatee population. 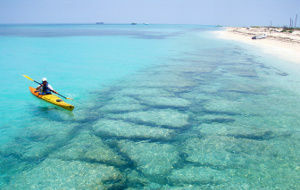 Made famous by beautiful mermaids, Florida’s central west coast has become the “nature coast”. 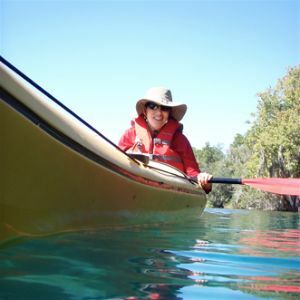 Enjoy a week of kayaking, canoeing, tubing, hiking, snorkeling with wild manatee, and exploring some of Florida’s largest springs. Every night we return to our private riverside lodge to relax and enjoy great company, river scenery, and southern cuisine done right. Day 1 — All participants will be picked up at one pm at the Orlando International Airport. Our private van will the take us to our river lodge near Dunellon Florida. We will stop for lunch in route. (not included in the trip price) After settling in the guides will go over the weeks schedule. Dinner and cocktails will soon follow. Day 2 — Today finds us paddling the Withlacoochee River. This river flows out of the Green Swamp in west central Florida. The river twists and bends through the sandhill area as it moves northwest. Hardwood forests with an under story of cabbage palm and saw palmetto border the river. Further downstream the hills disappear as you paddle through lush swampland with cypress, gum and maple adorned with air plants. The overhanging limbs form a lacy canopy. Much of the river flows through the Withlacoochee State Forest, but there are scattered residential areas along the river. 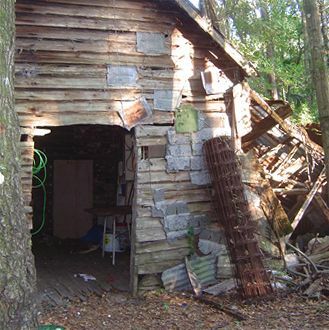 The variety of habitats offers opportunities for nature study. Wildlife is abundant along the river. Deer, turkey, otter and alligator are common. Wood duck, wood stork, white ibis and anhinga can also be seen. Day 3 — We start the day early to catch an early morning boat ride to Crystal River and the year round manatee that make this area their home. 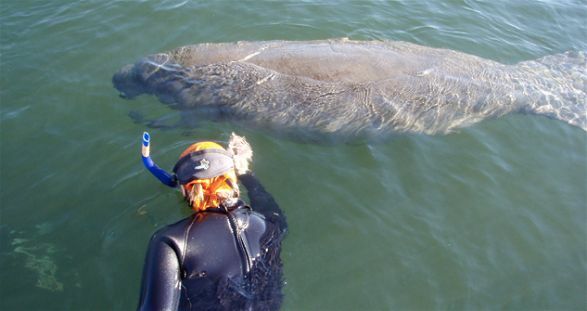 Make sure you bring your underwater cameras because we will jump over board and actually snorkel with these gentle giants. We return to the lodge for lunch then make our way to the head springs of the Rainbow River. This is a Florida classic lazy river, perfect for an afternoon of tubing and snorkeling. The crystal clear water allows us the opportunity to view otter, turtles, and alligators. The headwaters start at Silver Springs, the world’s largest natural artesian spring, which produces nearly 550 million gallons of water each day. 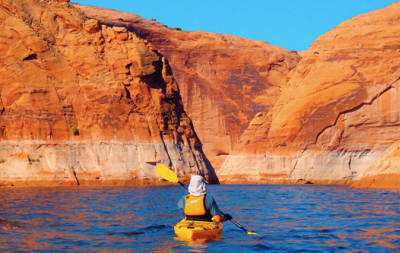 Because of the substantial flow, the paddle upstream can be strenuous but well worth the effort. Seven miles downriver, the crystal clear Silver meets the tea-colored Oklawaha River. Spending the day on Silver River will reveal why the Silver Springs attraction bills itself as “Nature’s Theme Park”. Beside the subtropical landscape, the river is famous for its abundant wildlife. 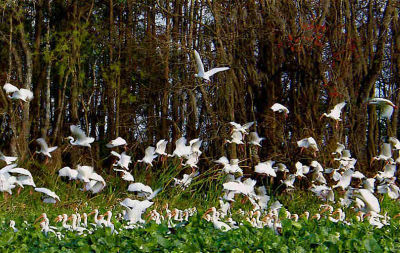 Anhingas, ducks, egrets, herons, ibis’, hawks, limpkins and kingfishers are some of the many birds that inhabit the area. The fish species is well represented by bluegill, sunfish, bass and prehistoric-looking Longnose Gar. If you have never seen one, gars are cylindrical fish up to four feet in length with long snouts and very sharp teeth. Reptiles are a-plenty too. Turtles and alligators can easily be spotted sunning themselves while lizards and snakes present more of a challenge. One animal that you wouldn’t expect to find in Central Florida is the Rhesus monkey. Several troops of these monkeys live wild along the length of the river. Legend has it the monkeys are descendants of escapees from Tarzan films shot at Silver Springs; however the Silver Springs web site (www.silversprings.com) lists the source as a concessionaire who operated the Jungle Cruise boat ride during the 1930s. The monkeys were placed on an island in the river and they simply swam off and disappeared into the neighboring forest. Day 5 — A very unique experience awaits us today. We will start with a visit to the large springs in Chaskawitzka National Wildlife Refuge. 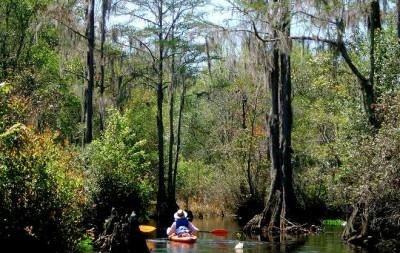 Then we will paddle towards the coast passing freshwater springs, thick hardwood hammocks, bayou, salt mud flats, then coastal plains. This refuge provides habitat for approximately 250 species of birds, over 50 species of reptiles and amphibians, and at least 25 different species of mammals. Endangered and threatened species on the refuge include manatees, sea turtles, and bald eagles. The refuge consists of coastal saltmarsh, shallow bays, tidal streams, and rivers, mangrove islands, and coastal maritime hammock. After dinner we will celebrate the full moon on a late night cruise onboard a private pontoon cruise boat down the Rainbow River or Withlacoochee River. With the bright moonlight guiding us we will seek out the nocturnal wildlife thick in the swamps, creeks, and sloughs we pass. Day 6 — Another exciting day! 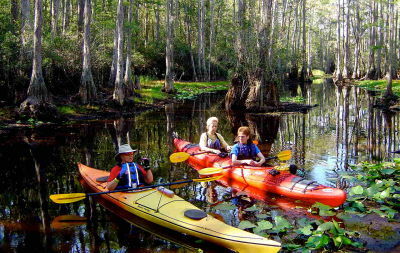 We will visit the Homosassa River and the Homosassa State Wildlife Park. The park has an underwater viewing room, where you can watch schools of saltwater and freshwater fish circling the manatees, plus a bird area, reptile lectures, and a large pen full of large alligators. 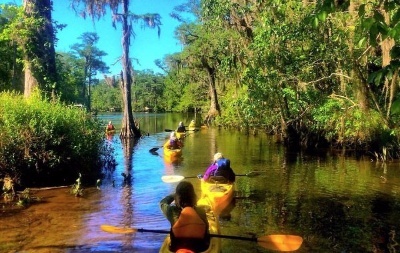 In the evening we will have time for more fun at Rainbow Springs or folks can rent bikes and peddle the Withlacoochee state trail that follows the Withlacoochee River. Day 7 — After a big breakfast and may be a morning hike, everyone will have time to pack up before heading back to Orlando and the airport. We should arrive at the airport between 2-3 pm..
We will be staying at The Rainbow River Club and Lodge. This is a private lodge that we were invited to stay at. Everyone will be staying in two bedroom cabins. One bedroom has a queen size bed the other bedroom has two doubles. Each cabin has a full kitchen, bathroom, and living room. The rooms are clean, there is hot water, and the showers work great. Couples will of course get the rooms with a queen size bed individual participants will be sharing the rooms with doubles.